New posts on the way! Apologies to everyone for the long, long inactivity. The past 3+ months have been extremely busy with changing living environments, a lot of travel, and a particularly heavy period at work. New posts are coming soon! Hold tight and thanks for continuing to read genYchina. Day 2 of following jazz festivals in Canada, and I am in Ottawa attending their outdoor jazz series in Confederation Park. Amid rain and thunder, we sit outside on the grassy field in our lawn chairs and umbrellas. 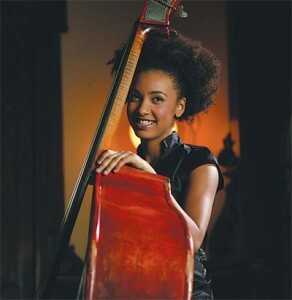 It is here that I first encounter Esperanza Spalding in person. As I’ve reviewed her album before (click here), I won’t go into too much detail again about her background. All I want to say is that her voice is killer. It is to die for, and it literally sent chills down my neck. Smooth and silky, her voice effortlessly scats and belts her way right through your heart. Absolutely killer. Her bass playing, as clearly demonstrated by her few albums, brings it all deep down to earth, and roots it firmly sincere jazz, and authentic soul. Finally, now that I’ve been able to see her upclose and personal, I must admit, I’m getting even more infatuated with her than I was before. She’s not just talented, addicting me with her music, but she’s got mad style (the soul kind) and, well, she is really hot. And she’s funny, with a bright and spunky personality. She has all the elements it takes to be a major commercial force on the billboard charts. Its a shame that it was pouring so much in Ottawa, I was forced to leave as the friends accompanying me were totally soaked through and in danger of getting sick. No matter though, I’ve already bought tickets to see Esperanza again at the Montreal International Jazz Festival July 2nd. This time indoors so I won’t be displaced by bad weather. 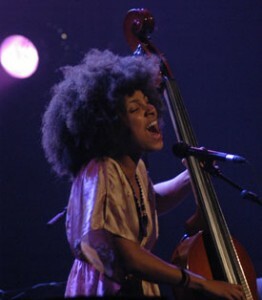 More to come as I prepare for my second attempt at Esperanza Spalding’s live experience.